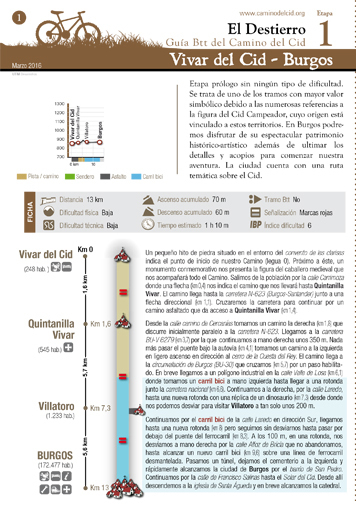 MTB topo-guides include all necessary information to plan your route by mountain bike: stages, distance in kilometres, elevation profiles, time route planners, routing problems, difficulty rating based on IBP and MIDE indicators, weather forecast, landscape, information on monuments and signs conveying useful information with regard to accommodation, train stations, pharmacies, etc. The topo-guides also include a list of places where you can obtain and stamp your Passport, bike repair shops and maps on a 1:63.000 scale map including information about towns along the route, limited cycling stretches, types of signposting, trail and surface types, depending on whether the route runs on pavement, rural paths or trails. Download all relevant information on PDF for free. File size is reduced and it takes up little printing space (9 sheets of paper).